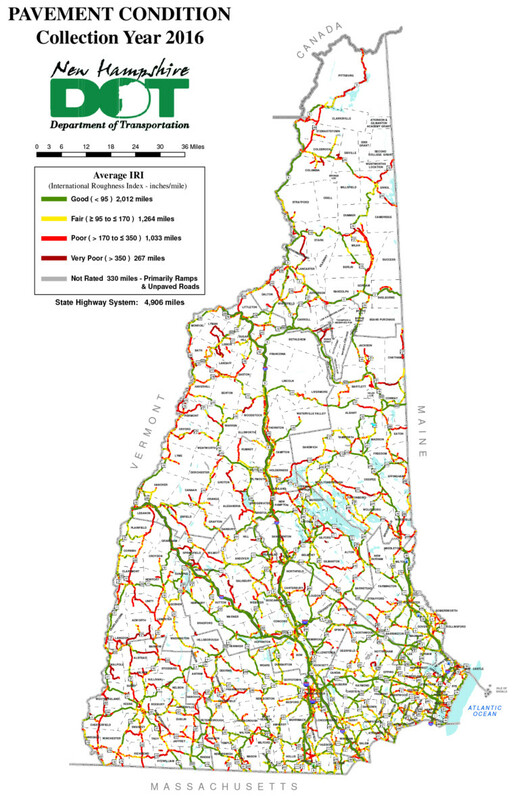 While the NH Department of Transportation regularly keeps track of the condition of both state and municipal bridges, there is no corresponding central database that catalogs the condition of city streets and town roads. However, the process of compiling the data has begun. Chris Dowd, who manages the Statewide Asset Data Exchange System at the Technology Transfer Center at the University of New Hampshire — better known as T2 — said that the process of building a database gathered momentum with a pilot project undertaken in 2016, and now 20 municipalities are participating. He said that each year the regional planning commissions enlist other municipalities in the process, which he acknowledged would take some years to complete. In 2015, the DOT, T2 and the Strafford Regional Planning Commission, with funding from the U.S. Department of Transportation, conducted a road inventory and condition assessment of the 17.1 miles of roadway in Rollinsford. The information was entered into the (RSMS) program, administered by NHDOT and T2, which selected appropriate repair measures and calculated their costs. The state is crisscrossed by approximately 16,125 miles of public roads. The state highway system — the turnpikes, interstate and secondary highways — represent 4,603 miles, or little more than a quarter of the total. The remaining 11,522, nearly three-quarters of the total mileage, consists of city streets, town roads and rural byways. And there are 3,846 bridges in the state — 2,169 state bridges and 1,684 municipal bridges. Nearly two-thirds of all goods shipped to and from the state are carried by commercial trucking. A consumer expenditure survey by the U.S. Bureau of Labor Statistics found that households spend 15 percent of their budgets fueling, maintaining, repairing, registering and insuring their vehicles. In 2013, TRIP, a national transportation research group, reported that driving on distressed roads costs New Hampshire motorists $333 million, or $323 for the average driver, a year in repairs. David Jeffers of the Lakes Region Planning Commission said that while the RSMS system has been in use for about 20 years, advances in technology have increased the efficiency and decreased the cost of applying it. He stressed that the system provides an “objective method” for not only monitoring pavement conditions but also budgeting for the maintenance and repair of roads. The system hinges on predicting the deterioration of roadways over time while prescribing timely maintenance measures in order to avoid the need for extensive and costly structural repairs. Pavement deteriorates at an ever-increasing pace. If not maintained, the pavement condition of a two-lane country road deteriorates by 40 percent in about 19 years, but another 40 percent in less than six years after that, when it will require reconstruction. The cost of rehabilitating, reclaiming or reconstructing a mile of roadway ranges from about two to more than six times that of preventative maintenance. The process begins with dividing the roads into segments, which are identified and mapped. Pavement inspectors survey the roads, recording and assessing the various types of distress. The data is then fed into a program that calculates a numerical value — Road Surface Rating (RSR) or Pavement Condition Index (PCI) — on a scale ranging from 0 to 100, the values of which correspond to an appropriate maintenance or repair strategy. Once the roads are scored, an appropriate repair strategy is applied to each. Typically, roads require routine maintenance, preventive maintenance, rehabilitation, reclamation or reconstruction in ascending order of expense. Routine maintenance usually refers to sealing cracks and patching potholes at little expense while preventive maintenance includes various forms of sealcoating or laying a protective layer atop existing asphalt to prevent damage from the elements. Rehabilitation requires milling and resurfacing the existing pavement to overcome more severe and widespread distresses. Roads are reclaimed by recycling the existing asphalt and sub-base to lay a new base and paved surface. Reconstruction begins with demolishing and removing the existing pavement, then grading and sloping the roadbed, laying the sub-base and paving the surface — building the road from the bottom up. Matching the scoring of pavement conditions to the cost of repair strategies provides an estimated cost to repair every road surveyed. For example, earlier this year the Beta Group Inc. of Boston prepared a pavement management plan for the city of Laconia. The report recommended reconstructing 4.31 miles at a cost of $2,631,221, or $610,492 per mile; reclaiming 7.92 miles at a cost of $2,711,017, or $342,300 per mile; and rehabilitating 22.41 miles at a cost of $214,595 per mile. By contrast, undertaking preventative maintenance on 11.93 miles was estimated to cost $1,074,271, or $90,047 per mile, and routine maintenance on 17.58 miles was estimated to cost $134,567, or $7,654 per mile. Altogether, the estimated cost of the recommended repairs amounted to more than $11.3 million. The report projected that by spending $800,000 a year, the city could maintain its RSR of 73.8, but by increasing the annual investment to $1 million or more, the RSR could be raised. A pavement management plan provides both an assessment of pavement conditions and a guide for budgeting repairs. Dowd said that a statewide database of municipal pavement conditions would provide an assessment of the state’s entire road network as well as indicate the level of investment required to improve and maintain it. Local property taxes fund the lion’s share of municipal roadwork -— state aid to municipalities for roadwork in the form of Highway Block Grants, which consist primarily of 12 percent gas tax receipts and total about $36 million a year. The funds are distributed according to a formula that lends equal weight to the total mileage and total population of the city or town and represents $1,400 for each mile and $13 per person. Another $400,000 is divided among municipalities with relatively low property values and relatively high road mileage. In 2017, the New Hampshire Section of the American Society of Civil Engineers graded the state roads a C-, or mediocre, on its annual infrastructure report card. The report recommended developing more sustainable sources of revenue to supplement returns from the gas tax, which have declined as fuel efficiency has increased. At the same time, the report stressed that municipalities should create capital reserve funds to match state funding for municipal projects. Jeffers noted that a pavement management plan “is not a full engineering report,” noting that roadwork often includes improvements to drainage, curbing and sidewalks, which adds significantly to the cost of projects. Pavement management is a piece of an even larger puzzle. Laconia City Manager Scott Myers said that the pavement management plan is a valuable tool, but must be financed and undertaken in coordination with other repairs and improvements to collateral infrastructure. In particular, he said that in the course of roadwork steps should be taken to address known issues with underground utilities, both municipal (sewer lines and water mains) and private (telecommunication conduits) in order to lessen the cost of the projects and avoid reopening newly paved roads.